Given the increased focus on fire performance of materials being used in the building and construction industry, a Group 1 test result for both components of the product (plasterboard and the rigid foam insulation) is the best possible outcome for the company. 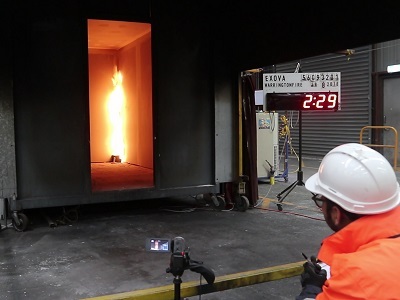 By putting their leading product through the rigorous AS ISO 9705 full room scale fire test, Kingspan Insulation has once again underlined their commitment to a program of global testing across their product range. The National Construction Code (NCC) requires a Group Number to be determined in accordance with AS 5637.1, where a full scale test is conducted. Although plasterboard products are only required to undergo small-scale testing (AS/NZS 3837), Kingspan chose to test Kooltherm K17 insulated plasterboard to the full scale AS ISO 9705 test to ensure performance. “We wanted to confirm our product was still fit to be used in all areas of all building classes and would perform as required. As a company we are focused on ensuring our products are up to standard and can provide the results we promise,” commented Kingspan Insulation’s Technical R&D & Accreditation Manager, Keith Anderson. Kingspan Insulation’s Kooltherm range already carries CodeMark, FM Approval, UL Listing, BRANZ Approval and Australian Made certifications across their product range.